Globally, there has been a decline in trust over the past few decades, and only a third of Americans believe they can trust the government, big business, and large institutions. In The Decision to Trust, Robert Hurley explains how this new culture of cynicism and distrust creates many problems, and why it is almost impossible to manage an organization well if its people do not trust one another. High-performing, world-class companies are almost always high-trust environments. Without this elusive, important ingredient, companies cannot attract or retain top talent. 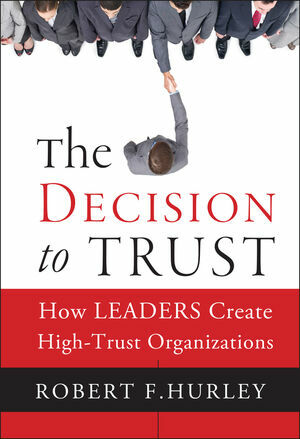 In this book, Hurley reveals a new model to measure and repair trust with colleagues managers and employees. Covering trust building in teams, across functions, within organizations and across national cultures, The Decision to Trust shows how any organization can improve trust and the bottom line. Robert F. Hurley is a professor at Fordham University and president of Hurley Associates,a consulting firm that uses behavioral science to enhance individual and organizational effectiveness. He is also a core faculty member in the High Impact Leadership program for executives at Columbia Business School. His work has appeared in the Harvard Business Review and the California Management Review, among other publications. He is based in New York City and Ridgefield, CT.